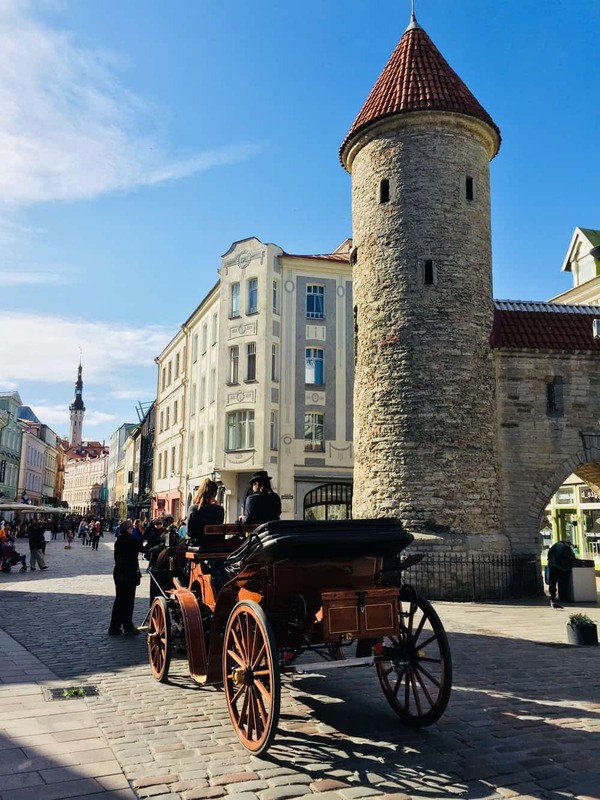 Tallinn’s old town is simply stunning. I can’t imagine anyone visiting it and not being a little bit overawed by its beauty – the atmospheric main square, the maze of medieval cobbled streets that wind around the city and the old city walls with its imposing watch towers. It’s an amazingly photogenic city, and you’re bound to come away with a collection of pictures worthy of hanging on any wall. The innate beauty and serenity of the place is a complete juxtaposition to the climate of paranoia and terror experienced in the city during Estonia’s Cold War occupation by Soviet forces from 1940 onwards. This was brought home to me with a visit to the city’s Viru Hotel, opened in 1972 to be a new luxury hotel in Tallinn, where with a one hour guided tour you’ll get a fascinating insight into a world that to most of us would seem alien. I went along knowing that my entrance fee would give me access to secret KGB rooms that were discovered on the hotel’s top floor in 1994, three years after Estonia gained independence from the USSR. What I didn’t know was that the entire hotel was caught up in the brutal oppression that was characteristic of this time and operated to suit the needs of the KGB – it was apparently regarded as a “state within a state”. Generally speaking, I prefer to wend my way around a museum in my own time, taking in the information at my own pace. Here, you have no choice as you have to pre-book a guided tour that takes you to the top of the building and into the two secret rooms. However, we were lucky enough to have an amazing guide for our tour who was brimming with tales about the hotel as it was during the Cold War and who really brought things to life for us; I have no doubt that it would have been harder to fully appreciate the significance of this Tallinn hotel without these incredible insights. 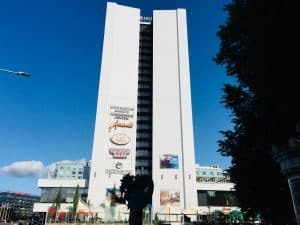 The tour kicks off with the revelation that you’re standing on floor 23, and that despite the hotel always advertising itself as a 22 floor establishment, there has always been one additional level – it is here that the KGB set up offices from which they conducted a large part of their operations in the city (the Headquarters of the KGB, along with their cells, are elsewhere in Tallinn’s old town, and it’s now possible to also visit these). This means that for some two decades after opening, very few people had ventured to the hidden world at the top of the building and it seems that only a few members of staff even knew it existed. The rooms have been set up to demonstrate the KGB’s operations. The first models an office, with desk, old style typewriter and newspapers with obituaries for both the Soviet leaders Leonid Brezhnev and Yuri Andropov (eagled eyed visitors, or those paying attention to the guide, will see that both articles were identical with just the names of the Presidents changed – apparently, the idea of a journalist to reduce workload given that they had died only two years apart). There are two telephones in here, the red one being a hotline to the KGB Headquarters in the centre of the city. 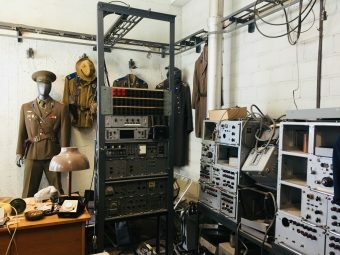 The second room is more of a control room with examples of surveillance equipment – cameras, listening devices – and uniforms on show. The guide also drew our attention to smaller items such as purses that could detonate a cloud of coloured dye all over anyone attempting to open it – this was a way of ensuring that staff working in the hotel did not resort to any theft or deception (or at least not a second time!). However, the KGB’s influence in the hotel did not confine itself to the 23rd floor. 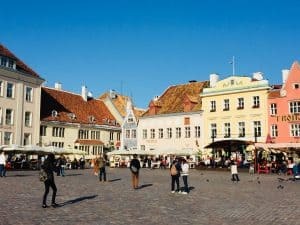 As a way of keeping tabs on visitors and bringing foreign currency into the country, the hotel was the only place that “foreigners” were allowed to stay in in Tallinn and the locals were never allowed to visit. The lengths that they went to monitor people were incredible: for example, the Finnish workers constructing the hotel were told to end work a couple of weeks early, leaving holes – presumably for what they thought were innocuous electrical fittings – unplugged; the KGB then plugged these holes with various surveillance devices, including wide lens cameras, that would allow them to spy on the residents in selected rooms. The more “dangerous” the visitor was deemed to be by the Soviets, the more likely they were to be placed in the rooms with the most intense level of surveillance; for this reason, repeat visitors often found themselves being allocated the same room. Other everyday activities such as ordering a taxi was most likely to lead to a KGB official driving it and diners’ conversations were often eavesdropped on via small microphones inserted into the base of bread plates or hidden as part of the restaurant décor. On every floor, there was also a babushka (an old woman or grandmother in Russian). Sitting by the lifts at the entrance to the floor, their role was to note all the comings and goings – every time a visitor returned to their room, this was noted and passed on. This supplemented all the other information that was being collected on a daily basis in the hotel. 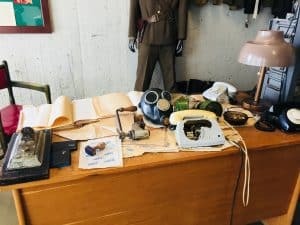 At the end of my hour in this small museum, I came away with a better understanding of Tallinn’s experiences during the Cold War, and also appreciating how lucky I am not to have lived through such terrible times. This really is an experience you should not miss when visiting this delightful city. Take in the old town: This is a must, with small cobbled streets and adjoining nooks and crannies to discover as well as the main square; when we were here there was a small market in the square selling a variety of local products. Sipping a drink in the square as the sun goes down and the lights in the bars and restaurants come on is a moment to savour – try to sit opposite the town hall and spot the dragons peeping out from the top. There are a number of churches to visit in Tallinn’s old town, including St Olav’s church where you can pay a small entrance fee to ascend the stairs to the rooftop – this gives panoramic views over the city. 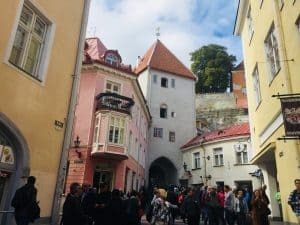 There are also other points in Tallinn where you can look out over the old town and its towers and city wall (I’d advise trying to do the old town and taking in these views either early in the day or late afternoon when the town is quieter and tour groups from the visiting cruise ships have dispersed). 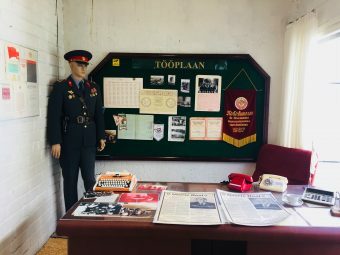 The Museum of Occupations: this is very small, but is a fascinating addition to a visit to the Viru Hotel, covering both the Soviet occupation of the city as well as the German occupation. The KGB Prison cells: this is another tiny museum in the centre of the Tallinn worth visiting to see the cells that prisoners of the state were kept in up until the late 1950s. The cupboard at the end of the corridor where prisoners were sometimes held was particularly sobering – the size was so small it would have been impossible to survive in it in anything approaching a comfortable position. 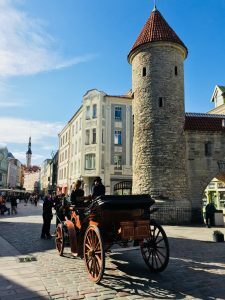 Other museums: Tallinn has a large number of museums, many unusual and quirky – for example, there is a marzipan museum, a puppet museum, a health care museum, and a film museum. Kadriog Park: a short jaunt out of the old town is Kadriog Park. This is a gorgeous park that is perfect for an afternoon’s stroll, with a lake (Swan Lake), fountains and beautiful flower beds. 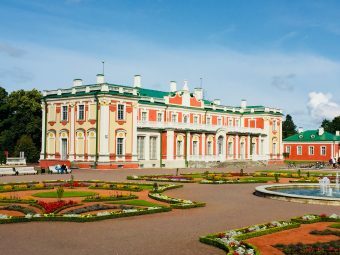 Kadriog Palace is here and is a stunning building, itself surrounded by beautifully tended gardens; it houses an art museum if this, rather than the history museums in the city, is more your thing. A short walk away is Tallinn’s Presidential Palace. The park is large enough to justify spending a while here and is a complete contrast to the old town which can become crowded in places with tourists. Spot the black cats: Finally, for any cat lovers, you could spend some time spotting the black cats that seem to pop up literally everywhere in the city – from soft toys, to pictures, to signs hanging over shops windows to ceramic statues. A little bemused, we asked a local why this was: apparently at some point in history, cats saved the city by leaving in droves when they spotted fire. The local residents, curious to know why they were leaving, followed them, thus being saved from almost probable death. How true this is I’m not sure, but as a cat lover, I’m choosing to believe that they did this! Travel information: Flights go to Tallinn from various countries including the other Baltic states, Scandinavian countries and from other part of Europe, including the UK. Check out timetables though as flights do not always fly every day. Helsinki can also be reached from Tallinn by ferryboat and can be as fast as one hour and 40 minutes; Stockholm can be reached in around 16 hours.